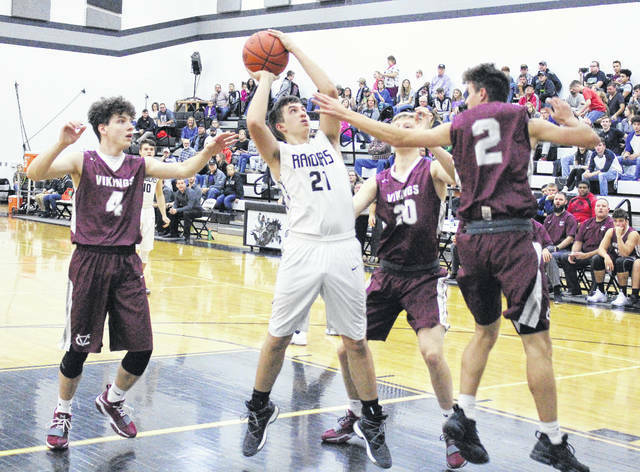 River Valley sophomore Matthew Mollohan (21) releases a shot attempt between a trio of Vinton County defenders during the first half of Tuesday night’s TVC Ohio boys basketball contest in Bidwell, Ohio. 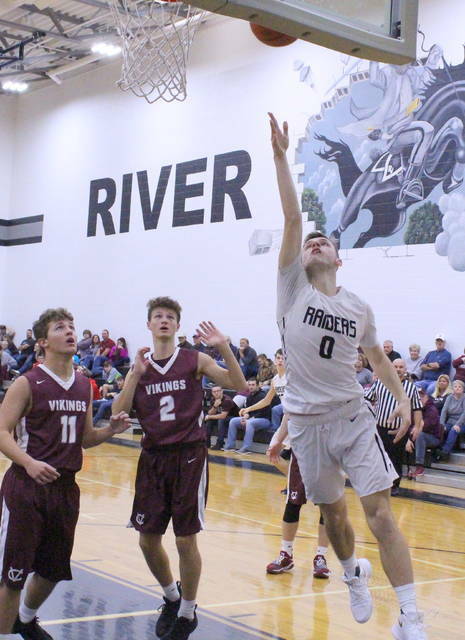 River Valley senior Dustin Barber (10) releases a shot attempt over a Vinton County defender during the first half of Tuesday night’s TVC Ohio boys basketball contest in Bidwell, Ohio. BIDWELL, Ohio — They were the better team for most part of three periods. Unfortunately for the Raiders, basketball is a game that goes four quarters long. 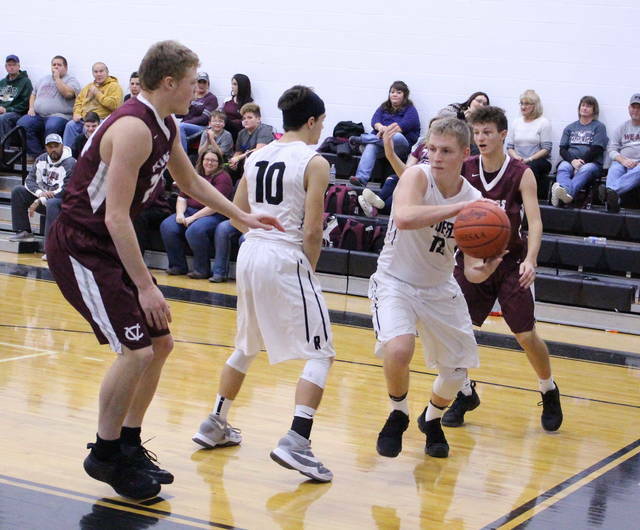 Visiting Vinton County made a pivotal 17-6 second quarter surge that ultimately made all the difference Tuesday night during a 69-63 victory over the River Valley boys basketball team in a Tri-Valley Conference Ohio Division contest in Gallia County. The Raiders (0-5, 0-2 TVC Ohio) came out firing on all cylinders as the hosts hit 6-of-8 trifectas and went 9-of-16 overall from the field in the first quarter, building a double-digit lead (26-16) before taking a 26-18 advantage after eight minutes of play. The Vikings (1-3, 1-1), however, countered by hitting 8-of-13 shot attempts and forcing five of the six turnovers in the second frame, which allowed the guests to turn an eight-point deficit into a small 35-32 edge at the intermission. Both squads shot better than 50 percent the rest of the way, and the Silver and Black outrebounded VCHS by an 11-9 margin down the stretch — but turnover differential also played a major role in the final outcome. Jarret McCarley capped a 7-4 run with a basket at the 5:53 mark of the third, tying the game up at 39-all. The Maroon and Gray countered with 17-9 run over the final 5:33 to take a 56-48 lead into the finale. 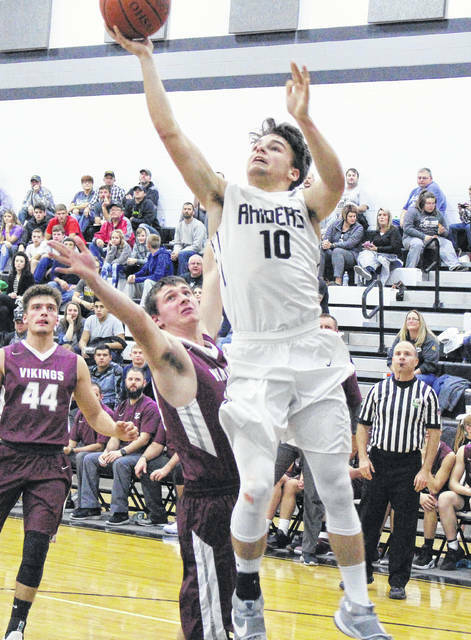 River Valley opened the fourth with a substantial 11-2 surge to reclaim the lead at 59-58 with 4:26 left, but Jake Speakman snapped an almost three-minute scoreless drought with a basket at the 4:08 mark the gave Vinton County the lead back at 60-59. Jordan Lambert responded with a basket at the 3:49 mark to give the hosts their final lead of the night at 61-60, but the hosts would commit four turnovers and go scoreless over the next three-plus minutes of play. VCHS made a 9-0 run over that same span, with Shawn McCarty capping things with a layup with 13 seconds left in regulation for a 69-61 edge. Matthew Mollohan completed the scoring with a layup with six seconds left, closing out the final margin of victory at six points. Despite being sizably smaller than the Vikings, the Silver and Black hung tough on the boards after being outrebounded by a slim 24-23 overall margin. VCHS also claimed a slim 8-6 edge on the offensive glass. The difference, however, came in turnovers — with the Raiders committing 14 of the 24 miscues in the contest. The hosts also had five turnovers apiece in the second and fourth frames, the same number that the guests had in each half. Combine those giveaways with the handful of easy baskets that the hosts missed throughout the course of the night, and one could understand the frustration that RVHS coach Bryan Drummond was left with following the game. Drummond was pleased, however, with the way his troops competed on the glass — particularly against a squad that owned a substantial advantage on the inside. The Silver and Black — despite a 2-of-11 performance in the second canto — finished the night by making 24-of-51 field goal attempts for 47 percent, including a 9-of-20 effort from three-point range for 45 percent. The hosts were also 6-of-8 at the free throw line for 75 percent. McCarley led the Raiders with 21 points, with 13 of those coming after the break. Layne Fitch was next with 13 points, followed by Mollohan and Chase Caldwell respectively adding eight and six markers. Rory Twyman contributed five points, while Lambert and and Dustin Barber each chipped in four points. Patrick Brown completed the RVHS tally with two markers. McCarley led the hosts with six rebounds and Brown hauled in five boards. Barber and Lambert also grabbed four caroms apiece in the setback. The Vikings went 29-of-56 from the field for 52 percent, including a 7-of-21 effort from behind the arc for 33 percent. The guests were also 4-of-8 from the charity stripe for 50 percent. Speakman led VCHS with a game-high 32 points, with 19 of those coming after halftime. McCarty, Eli Griffith and Naylan Yates were next with 10 points apiece, while Cameron Hamon and Bryce Dameron completed the scoring with respective tallies of five points and two markers. Bailey Bartoe hauled in a team-high six rebounds and Griffith also grabbed five caroms for the victors. River Valley returns to action Friday when it hosts winless Meigs in a TVC Ohio contest at 7 p.m.